Visiting my hometown, from which I’ve been away for almost 35 years, is always a special moment. Florianópolis is not only a very nice place worth visiting, but for me it’s also a wonderful bag of memories. In the early 70’s I was just a like any other teenager around the world, loved to listen to Black Sabbath, Led Zeppelin and Carlos Santana, among others, and enjoyed partying with friends. But differently from other kids anywhere else in the world we used to visit quite frequently a rather unique place, “Kibelândia” or, literally, the land of kibbe. “Kibelândia” was then a small joint (it was stablished in 1966), neglected by almost every grown up in town, a rather typical magnet for teenagers. 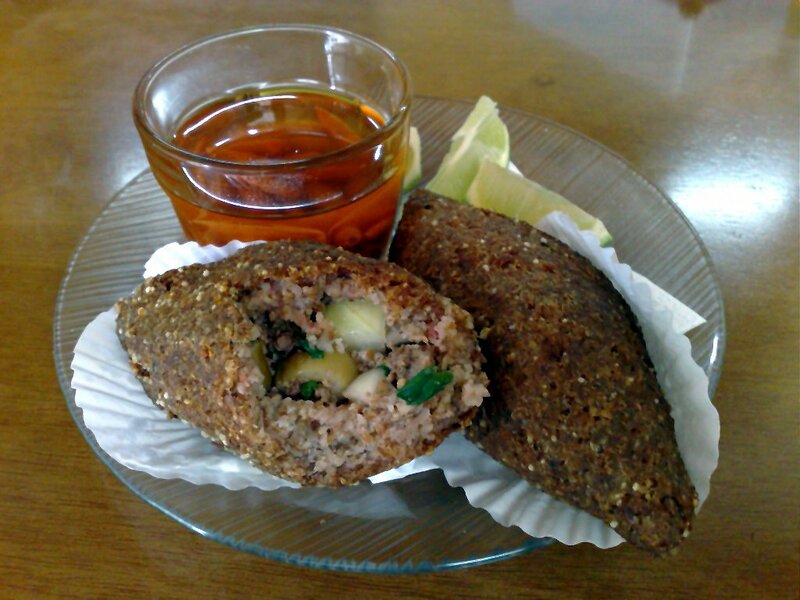 Kibbe, or kibbeh, is a Middle Eastern dish, and Lebanon’s national dish, found in many forms, the most common one a torpedo-shaped fried croquette stuffed with minced beef or lamb. The basic recipe contains burghul (a kind of crushed wheat) and chopped meat to which spices like garlic, onions, cinnamon, pepper and mint may be added. The kibbes at “Kibelândia” were prepared and fried right before your eyes (you could even see when the cook licked his finger to open a hole in it were an olive was placed). I don’t know if because of this nasty habit or not, but the kibbes tasted great. During my last visit to Florianópolis I was invited by my brother-in-law to have a kibbe with beer at “Kibelândia”, and for my surprise it still exists in the very same address (Rua Victor Meirelles, 98), right in the heart of town. To my joy the kibbes were very good, even though you can no longer see if the cook still licks his finger (the olive was inside though). 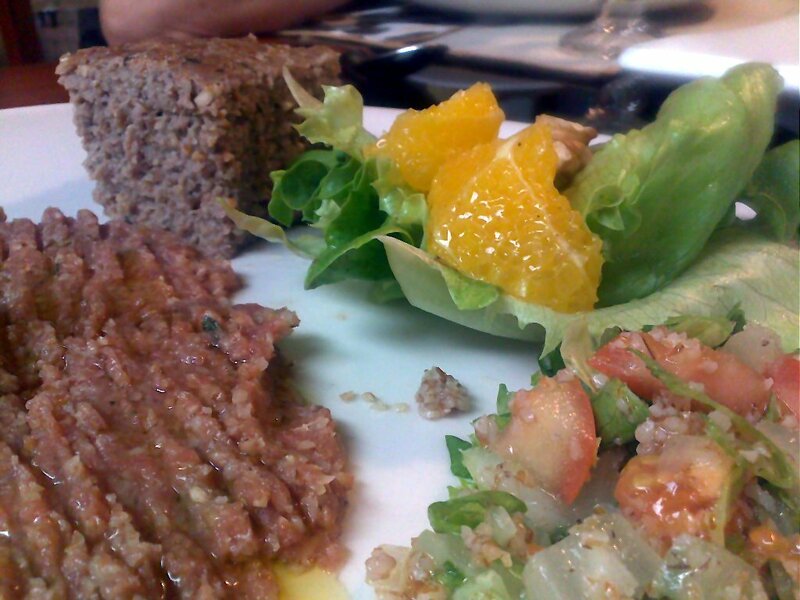 One kind of kibbe I never eat outside my home is “kibbe nayyeh”, or raw kibbe, a type of steak tartare. At home we prepare it mixing ground beef or lamb with burghul (around 60%:40%). Add some cold butter (around 100 g for every 2 pounds of meat) and seasoning (we use lots of garlic and mint and a splash of Syrian pepper). The burghul should be soaked in water before combining with the meat (there is some controversy on that). Traditionally the fat used in Lebanon is “samma”, a kind of clarified butter, or the fat obtained from the tail of a sheep (I haven’t been able to find that around here yet). The meat is then shaped like a loaf of bread, scored with a knife and drizzled with olive oil. 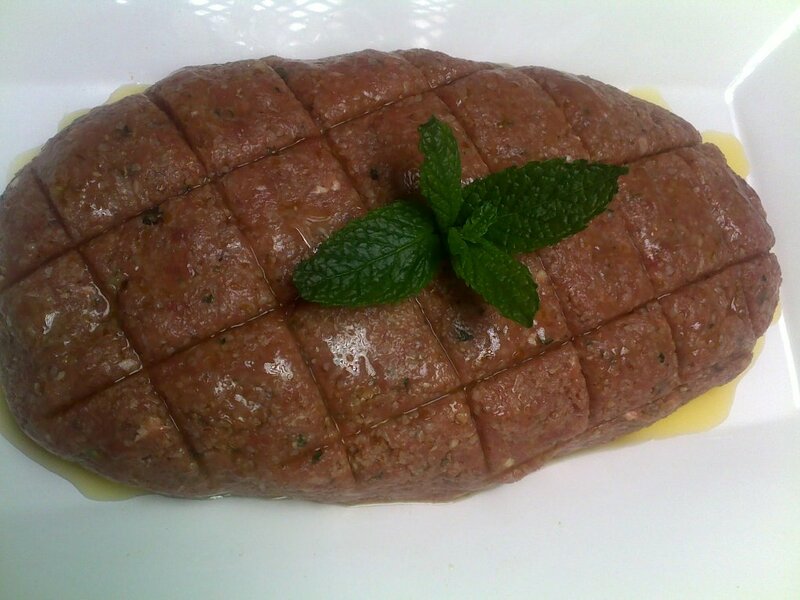 Kibbe nayyeh - Lebanese steak tartar? You can also press the raw kibbe in a flat baking pan, which is then scored with a knife into diamond shapes about one or two inches in length, topped with olive oil and then baked in the oven until done (be careful not to let it dry). This is called “kibbe bi saniyeh” or “kibbe in a tray”. At home we eat kibbe (usually two or three variations) with a very simple salad made with lettuce, slices of orange and walnuts, dressed with a mixture of olive oil, orange juice and cinnamon (try it, I’m sure you’re going to aprove it). Tabbouleh and pita bread are also mandatory presences.